After some suggestions i had decide to share my competencies virtual card with the development community, And i think was an interesting result. One final thought with this process i found that my Microsoft certification transcription file was incomplete, Microsoft learning program will correct the problem soon. In 21 January i had participate as speaker in the APP Swipe Microsoft event, as i said in the previous post my presentation was about TypeScript. Tomorrow i will be at Microsoft Portugal speaking in an event named Windows 8 App Swipe. In this event the main goal is to show code and let the slides deck at home, i think it we will have a motivated and curious audience (to know more about the event go to https://msevents.microsoft.com/cui/EventDetail.aspx?EventID=1032541591&culture=en-us ). At my demo session i will play and show to the audience something that has been really refreshing to learn in the past 4 months TypeScript. Tomorow i will post the code i had used in the event and the presentation script. 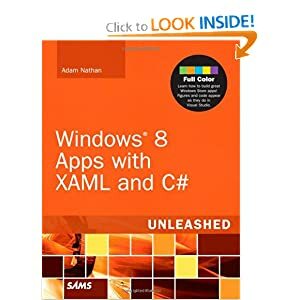 The Windows 8 Apps with XAML and C# Unleashed publisher had ask me some months ago to help in the review of Adam Nathan book. I must confess when I begin to read the book to make a review, my expectations wasn´t to high. But it was a nice surprise. This is one of the most refreshing technical books I had read lately. I had learn a lot with the author, who reveal himself in each chapter a great teacher. I had been in the front line of Windows Store apps development, since the release of the first beta of windows 8, i have at the moment a lot of code developed for windows 8, and a lot of work in mentoring/Teaching of Windows 8. This is now the book I would recommend to anyone who want to learn Windows 8 mindset and development using XAML/C# for the operating system. This book is a great knowledge asset for beginners or advanced developers. I would like to had read this book sooner and I am sure I would had quick learning curve of Windows store aps Xaml/C# development. Is a true high class technical Book. I had spend this weekend collaborating with EDIT a Criative\UX\Technological professional Portuguese school in an event. From time to time EDIT allow the community to have access to some specialized free Workshops and some conferences, they call this event Open DAY. The first day of the event was based on conferences, in this event they had as speaker’s Carlos Matias, Art Director of Nike in AKQA that had shown what nike had been doing, then we had Vasco Durão a Brand Strategy Director na Mola Ativism that had presented a excelent talk, João Vitória, Head Of Emerging Media na Fullsix Group, Mário Alcântara, Head Of Digital na DDB Lisboa.